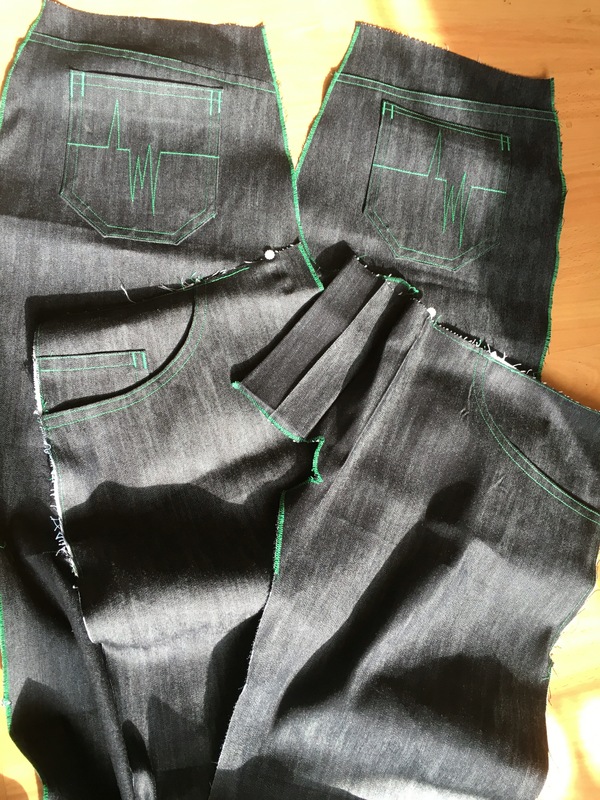 I’ve been wanting to make a decent pair of jeans since day one. After just a couple of months of sewing I attempted KwikSew 3504. The sewing wasn’t too bad, but the fit was terrible. I had no idea how to alter the pattern, so started researching the topic. It looked hard. I forgot about jeans for a while. 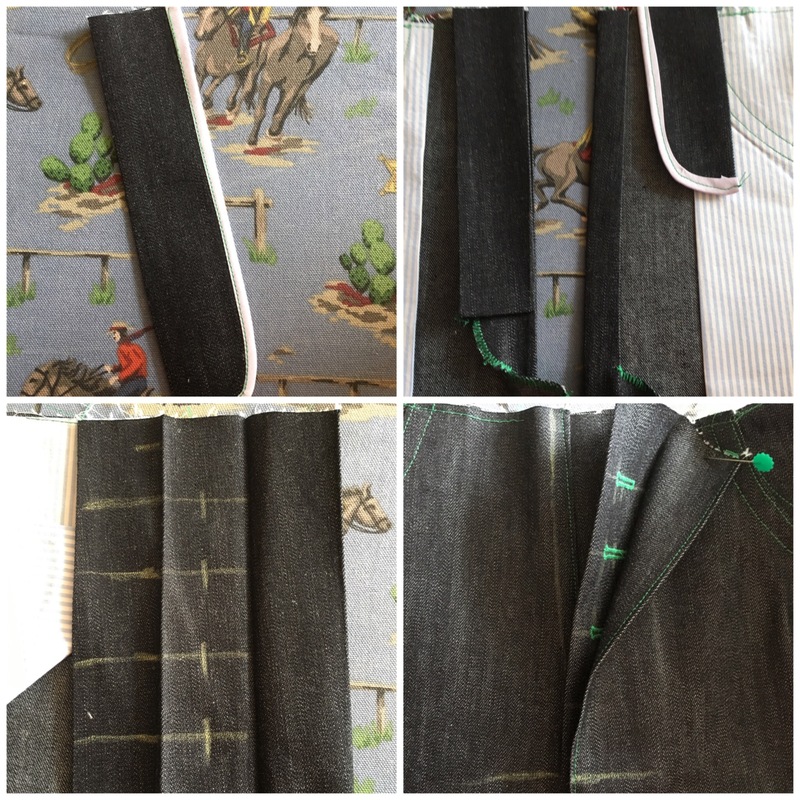 I concentrated on making shirts & also made some headway on perfecting the Jededdiah pants pattern for my work trousers. 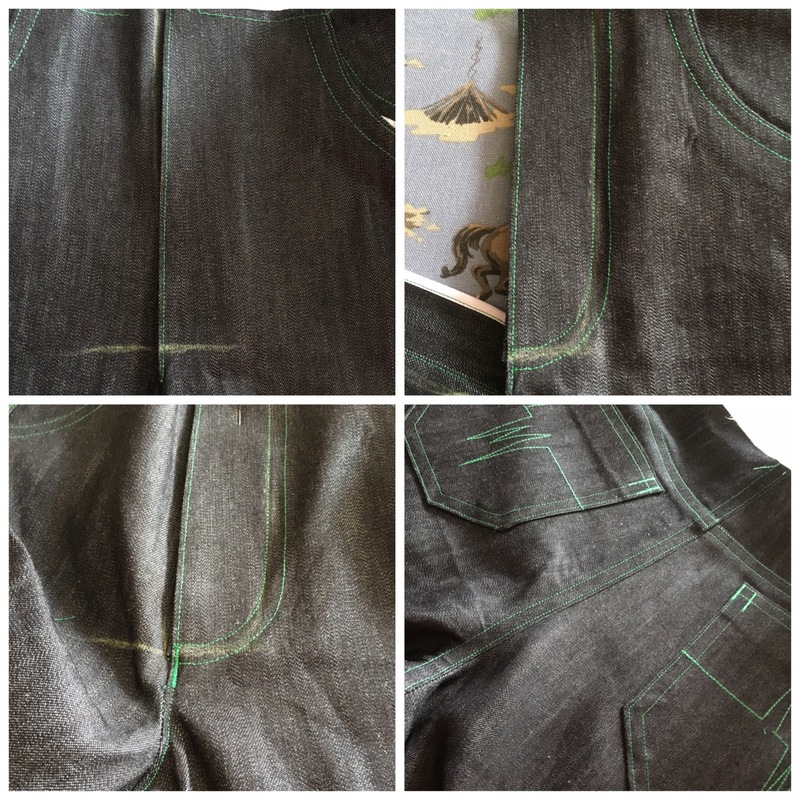 Eventually I attempted to draft curved pockets and a button front for my Jededdiah pattern and make them up as jeans. Not a good idea. Again, I was happy enough with my stitching, but I’m clearly not a pattern drafter yet… they just didn’t sit right. 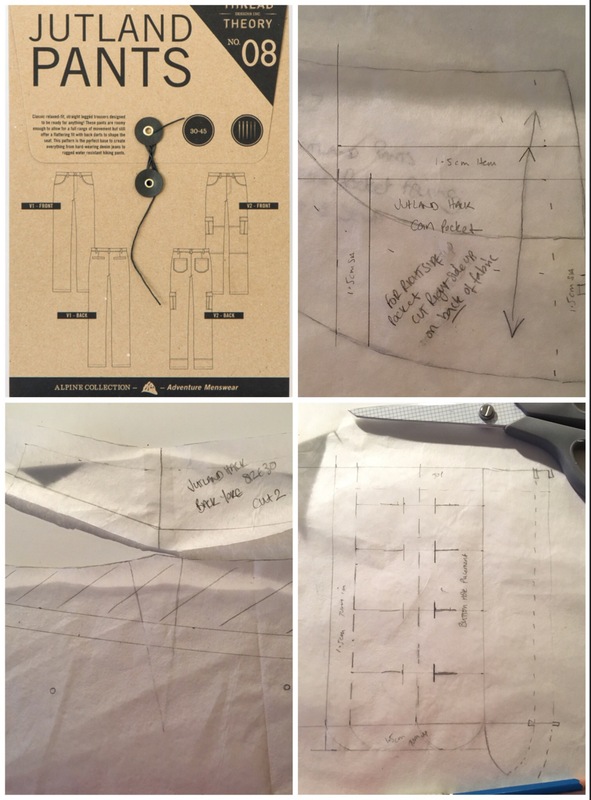 read the pattern book, measured myself & compared with the measurements. This time I paid particular attention to the ‘finished garment’ measurements & decided I’d be more comfortable in the size 30 instead of the 32. Maybe I wear my trousers too tight…? I wanted a coin pocked, so overlayed the pattern pieces & traced out the shape I needed. I also removed the back dart & added a yoke. I marked the line for the yoke & added seam allowance, then traced the yoke piece to the seam line. I cut the excess piece from the top of the main pattern piece. Measured what was left of the dart, divided by 2 and took in each side by 1/2cm. I taped up the dart on my new yoke piece & added seam allowance. My last tweak was to add a double width placket (& 1.5cm fold) to the left fly extension. This was so I could add a button fly instead of zipper. I taped this onto the front pattern piece & folded the extension & left front fabric out of the way while I cut the right front. First I put the front pockets together. I’ve made a few pairs of Thread Theory pants before, so I didn’t refer to the instructions much, although they are very good. I double top stitched the curved edge, enclosing the trimmed down seam allowance & I French seamed the pocket bags. The denim was a bargain by the way. On a trip to Cornwall I was allowed a quick whizz through Trago Mills. I got the denim for about £5 pm and a couple of shirt fabrics for £3 & £4 pm that made up really nicely. Next time I’m anywhere near Cornwall I’m taking hard cash and a big empty rucksack! 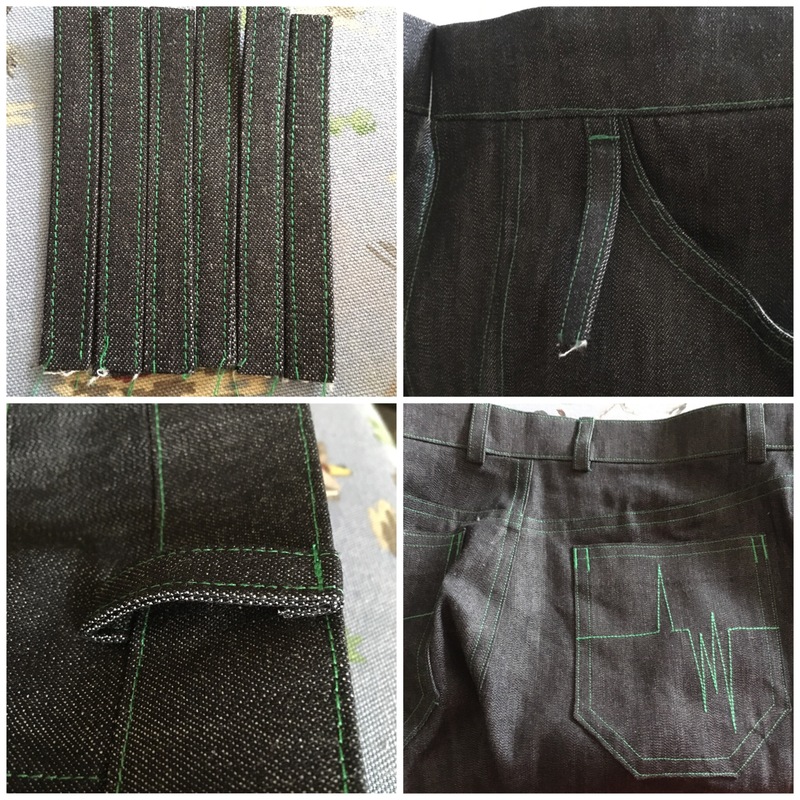 For the back pockets, I used the patch pocket from the cargo pant variation. 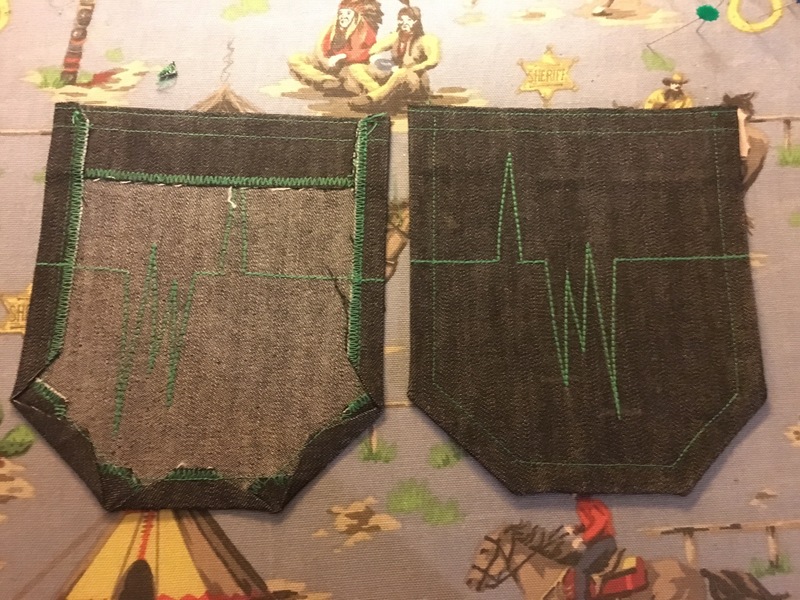 I designed the decorative stitching to look like a heart-blip monitor, but it’s also (sort-of) my initials (A.M.) so I didn’t flip it for the other pocket, just shifted it over a bit. Here they are (above) with the front & back pockets finished, back yoke attached & fly extensions pressed. 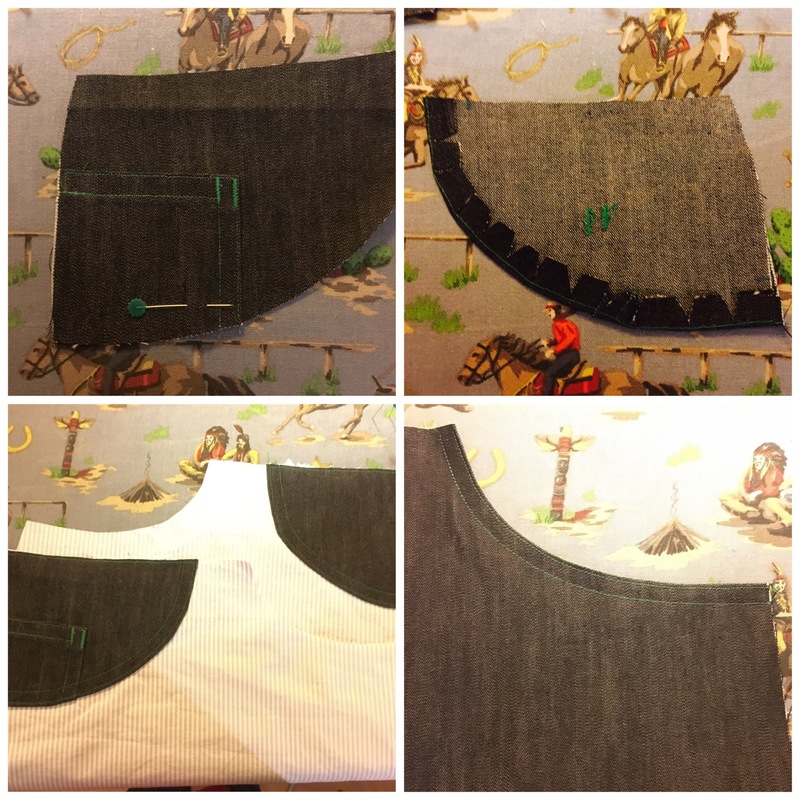 I considered flat felling all the seams, but, still unsure of the finished cut, I decided to save time & faux-felled by zig-zagging the seams together then top stitching from the right side (I wonder what excuse I’ll use to not flat-fell next time…?). I used the stitch-in-the-ditch-foot & offset the needle 4mm. Then stitched again using the regular presser foot edge along the 1st stitching line to keep the distance regular. The button fly was much easier, I thought, than the zip fly. I guess it’s more effort doing the buttons, but it’s less fiddly. I suppose, if you’re really careful, you could do each side separately before sewing up the front crotch seam. That could make it even less fiddly. I’ve practised (& blogged about) this before, so I was pretty happy with how it turned out. I faux-felled the inseam, basted the out seams & tried them on… Success! They fit!!! It was difficult not to finish the rest in a frenzy, so I took a few deep breaths & tried to take my time to finish them nicely. I bit the bullet & top stitched the outside seams too, right up the tube. I always find this fiddly & try to avoid it, but I took it slow & it turned out well. I’m glad I made the effort as I’m really happy with the finished result (not pictured!). Just the waistband to go. I folded the seam allowance on the waistband facing before attaching the waistband. I find it easier & neater this way. I also used fraycheck on the raw edges of the belt loops. I’m really happy with how these have turned out. My next plan if it hadn’t, was to take apart my old jeans & attempt to make a pattern from them. Im going to save that spike on my learning curve for another day! I still like to wear my jeans a little lower, so I will eventually have to bite the bullet & attempt that Rise Adjustment that I’ve been reading about. It doesn’t sound so tricky, but the slash line goes through a lot of pieces, so I know it’s going to include a lot of rubbing out & head-scratching! Read the size charts carefully. Check supplies on the run up to a project (I only had one jeans button, it went on a bit wonky, I’ll have to replace it sometime… maybe I’ll wait until it falls off). 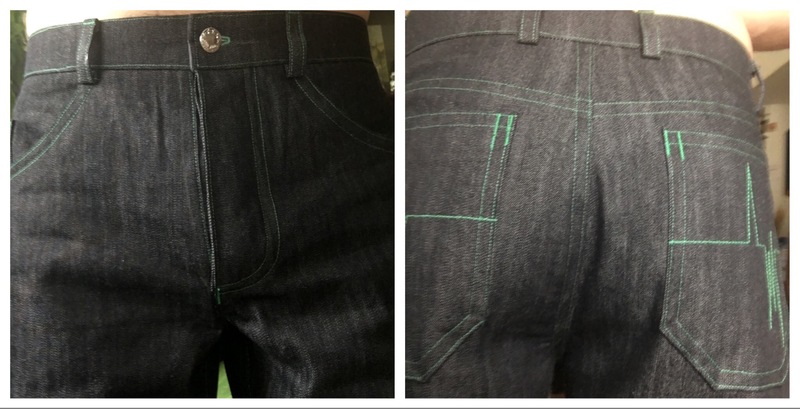 Adjusted stitch length twice & stitched seat & crotch seam 3 times to strengthen. Faux-Felling takes about as long as Flat-Felling once you’ve stitched, zig-zagged, pressed & carefully top stitched… Twice! Thanks for reading. Until next time, happy sewing! Previous Previous post: They’re Pants! Next Next post: Rise and Shine! Thank you! I used the triple stitch to make it stand out, but will try double thread next time! I’m SO happy with them!